Bill Lynch, Untitled (Spider Web and Butterflies), n.d., oil on wood, 49 x 32 1/2 x 1". 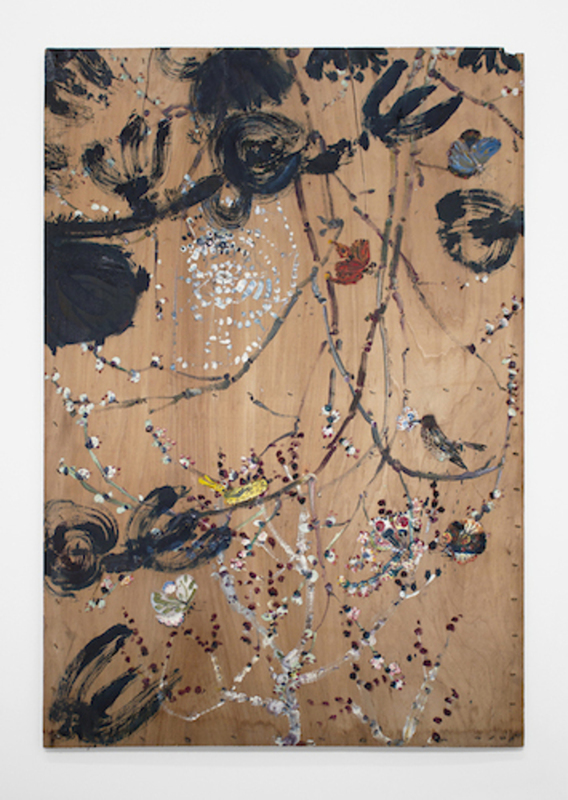 A lambent quality suffuses Bill Lynch’s mostly untitled and undated paintings on scavenged plywood, executed during the last thirty years of his life. A furtive incandescence hovers inside them. Euphorically ambiguous, in the same breath they celebrate Chinese Ming dynasty flower-and-bird compositions, which hold complex symbolization and interior resonance, and Mesoa-American shamanistic burial textiles. In the former case, heavy impasto eclipses the lyricism that we associate with the genre, likening them more to the Chinese modernist tradition of Zhao Shaoang, whom Lynch admired. Floral and vegetal forms hang next to spiderwebs; lurking monkeys, twisted trees, and blue-and-white porcelain flirt with both aesthetics and affliction. Puzzling clues like the grave marker in Untitled (Marker), 2010, suggest but ultimately withhold any definitive last word. Lynch’s exuberant pursuit of banal beauty leaves monstrous moments of congealed paint surface in its wake, not to mention perceptual disparities. In Untitled (Red Goblet with Deer), n.d., as we look down upon a tabletop with plates, we simultaneously look out onto a vignette of a figure gazing into a far-off seascape. Lynch employed this rückenfigur alongside other traditional devices, but his perspective is tremendously invigorating and unusual. In his renditions, the rectilinear surface becomes a place of close-looking at paint, at the uncompleted stroke, and of considering spiritual meaning in a contemporary world. A book of Zhao’s artwork and correspondence can be found in Lynch’s estatethe artist passed away in 2013 after suffering from schizophrenia for many years, and this show was curated by his friend and fellow artist, Verne Dawson.